Birds Need Fresh, Clean Water - And You Can Provide It! Water is one of the most important things birders can add to their yard to attract birds, and a good water source can be even better than food for inviting feathered friends to visit. All bird species need water, and adding one or more water features to your yard will quickly attract birds, including those that may never visit feeders. Birds need water for two reasons: drinking and preening. 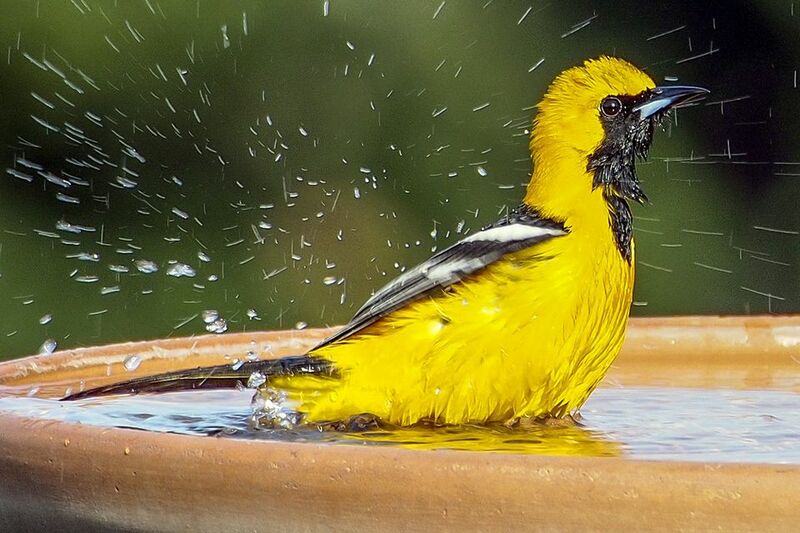 Water helps keep a bird’s body cool both from the inside and outside. Water baths can also remove dust, loose feathers, parasites, and other debris from a bird’s plumage. Offering water in your yard will attract more birds than just food sources, since birds that would not normally visit feeders can still be tempted by water features. Any water is an improvement on a dry yard, but standing water is the least effective for attracting birds. While they will eventually find it, standing water is not dynamic enough for many migrating birds or casual visitors to notice as they pass by. Moving water will attract more birds more quickly because the motion catches their eye and they can hear any dripping, sprinkles, or splashes. Adding a jiggler or wiggler accessory to a standing bird bath adds motion easily. A hose dripping into a dish or pond can have a similar effect and will attract more birds than just a dish or basin of still water. Active splashes can be heard from quite a distance and will attract a wide range of bird species. Flowing water, such as waterfalls, creeks, or streams, also stays cleaner and is less likely to harbor parasites or bacteria that could harm birds and make the water less suitable. Pedestal: These classic baths stand three to four feet above the ground and include a post-style base supporting an elevated dish. Pedestal bird baths may be plastic, metal, glass, ceramic, or concrete and come in many decorative designs and colors. Some models also include small fountains or bubblers. Dish: Any simple saucer or shallow bowl can be used for a basic bird water dish. Dishes can be used at different heights by being placed on the ground, a fence, patio table, stump, or steps. Hanging dishes and models that attach to deck railings are also available. Heated: A heated bird bath is essential in colder climates. It takes a great deal of energy to melt snow to drink, and birds willingly visit available water sources all year round. Immersible heater accessories can be added to existing bird baths, and fully heated models are available as well. For birds to feel comfortable using a bird bath, it should not be more than two or three inches deep. Adding an overturned saucer or level rocks to the center of the bath can add a shallower section or island for birds to use. The bird bath should also have rough surfaces to provide traction and stability when wet. Misters are a favorite way for hummingbirds to find water and they will often hover in a mister repeatedly on a hot day. Misters also provide moving water to attract other birds, and if they are properly positioned they will drip into a bird bath for even more motion. Misters may be attached to fountains or elaborate bird baths or they can come as separate water features that attach to a garden hose. For the best effect, position the mister in a partially shaded area that has several perches available for birds to take advantage of. Aiming the mister at broad leaves will help collect water, and small birds might rub against the leaves to bathe. Reflections of the glistening leaves will also help attract even more birds. Backyard ponds of any size can attract songbirds, wading birds, and waterfowl. The pond should have areas that are shallow enough for small birds to bathe and the water level should reach perches for easy drinking access. Ponds can often be combined with waterfalls or streams to add moving water to attract even more birds. Adding lilies, fish, and other natural elements will help create both food sources and shelter that will make the water especially attractive to ducks, geese, and other water birds. The largest ponds may even attract kingfishers, coots, gallinules, and other species. Waterfalls can cascade into a pond or be independent arrangements without pools. The movement and noise of the water will interest many birds, and structuring the waterfall to help birds access the water flow can create a dynamic bathing and drinking station. The waterfall should include shallow basins or ledges that collect water. Some birds will stand under small water streams, but very heavy, turbulent falls are less desirable. Natural materials such as slate and native rock will be the most attractive to birds. Add bird-friendly landscaping around the waterfall to create a complete habitat with food plants and shelter. An artificial or natural stream adds flowing water to a backyard landscape that will be especially attractive to birds. Adding rocks will create perches and keep the water depth suitable for birds to drink and bathe. If the stream is large enough to include a small bridge, nest boxes can be added beneath the bridge to attract swallows and other birds that thrive on the insects near water. Water features will attract the most birds when the water is clean and fresh. Standing water features such as bird baths and dishes should be cleaned daily, while moving and flowing water sources will naturally stay fresher and can be cleaned less frequently. Birders should never add harsh chemicals to water features to control algae growth or purify water. Even in small concentrations, such chemicals can be toxic, even deadly, to birds. Pesticide, fertilizer, and herbicide use should also be limited near bird water features to avoid accidental contamination of the water supply. Attracting birds with water is easy, and there are many simple ways to add fresh water to your yard to entice birds for a drink or a bath. Once you have that resource available to birds, you'll be astonished at how many different species take advantage of it.